German Talmudist and archeologist; born in Pinne about 1800; died in Berlin 1880. 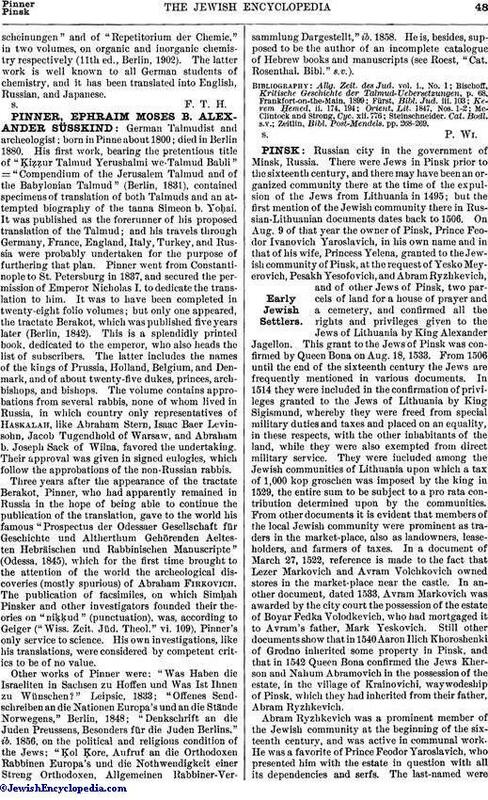 His first work, bearing the pretentious title of "Ḳiẓẓur Talmud Yerushalmi we-Talmud Babli" = "Compendium of the Jerusalem Talmud and of the Babylonian Talmud" (Berlin, 1831), contained specimens of translation of both Talmuds and an attempted biography of the tanna Simeon b. Yoḥai. It was published as the forerunner of his proposed translation of the Talmud; and his travels through Germany, France, England, Italy, Turkey, and Russia were probably undertaken for the purpose of furthering that plan. Pinner went from Constantinople to St. Petersburg in 1837, and secured the permission of Emperor Nicholas I. to dedicate the translation to him. It was to have been completed in twenty-eight folio volumes; but only one appeared, the tractate Berakot, which was published five years later (Berlin, 1842). This is a splendidly printed book, dedicated to the emperor, who also heads the list of subscribers. The latter includes the names of the kings of Prussia, Holland, Belgium, and Denmark, and of about twenty-five dukes, princes, archbishops, and bishops. The volume contains approbations from several rabbis, none of whom lived in Russia, in which country only representatives of Haskalah, like Abraham Stern, Isaac Baer Levinsohn, Jacob Tugendhold of Warsaw, and Abraham b. Joseph Sack of Wilna, favored the undertaking. Their approval was given in signed eulogies, which follow the approbations of the non-Russian rabbis. Three years after the appearance of the tractate Berakot, Pinner, who had apparently remained in Russia in the hope of being able to continue the publication of the translation, gave to the world his famous "Prospectus der Odessaer Gesellschaft für Geschichte und Altherthum Gehörenden Aeltesten Hebraäischen und Rabbinischen Manuscripte" (Odessa, 1845), which for the first time brought to the attention of the world the archeological discoveries (mostly spurious) of Abraham Firkovich. The publication of facsimiles, on which Simḥah Pinsker and other investigators founded their theories on "niḳḳud" (punctuation), was, according to Geiger ("Wiss. Zeit. Jüd. Theol." vi. 109), Pinner's only service to science. His own investigations, like his translations, were considered by competent critics to be of no value. Other works of Pinner were: "Was Haben die Israeliten in Sachsen zu Hoffen und Was Ist Ihnen zu Wünschen?" Leipsic, 1833; "Offenes Sendschreiben an die Nationen Europa's und an die Stände Norwegens," Berlin, 1848; "Denkschrift an die Juden Preussens, Besonders für die Juden Berlins," ib. 1856, on the political and religious condition of the Jews; "Ḳol Ḳore, Aufruf an die Orthodoxen Rabbinen Europa's und die Nothwendigkeit einer Streng Orthodoxen, Allgemeinen Rabbiner-Versammlung Dargestellt," ib. 1858. He is, besides, supposed to be the author of an incomplete catalogue of Hebrew books and manuscripts (see Roest, "Cat. Rosenthal. Bibl." s.v.). Zeitlin, Bibl. Post-Mendels, pp. 268-269.